The Madison Warhawks will take on the top-seeded La Costa Canyon Mavericks in the Division I semifinals. #1 Oceanside 38, #8 Carlsbad 0. #4 Mission Hills 38, #5 Eastlake 27. #3 Helix 58, #6 Ramona 35. #2 Cathedral Catholic 27, #7 Torrey Pines 0. Last season's inaugural Open Division Championship participants will battle it out for the right to make a second appearance. Mission Hills have won five straight games since falling to Oceanside 42-16 in week 7. This game also marks the 21st straight season that the Pirates reached the semifinal round. Both teams will be looking to make their first Open Division Championship appearance in school history in a rematch from a week four contest that saw Cathedral edge Helix 9-7. The Highlanders have not appeared in a championship game since their state title run in 2011, while the defending Division I champion Dons are hoping to make it two in a row. #8 Grossmont 57, #9 Westview 34. #5 Point Loma 47, #12 Mount Miguel 35. #6 Vista 35, #11 Olympian 14. # 7 El Camino 31, #10 Valhalla 17. #1 La Costa Canyon 47, #8 Grossmont 28. #4 Madison 49, #5 Point Loma 28. #3 St. Augustine 24, #6 Vista 12. #7 El Camino 33, #2 Steele Canyon 31. Madison will be looking to end a trip to Carlsbad with their ninth straight win, and first championship berth since 2012. La Costa Canyon is 2-4 in their last six games, but a shot a their first title game since 2008 should give them the spark they need to make things tough on the Warhawks. To extend their hopes of breaking a 14-year title drought, El Camino will need to slay another Division I giant. After a rough start to their promising season, St. Augustine find themselves still in the hunt for their second straight section title. #8 Mt. Carmel 39, #9 Del Norte 33. #5 West Hills 41, #12 Imperial 27. #11 Scripps Ranch 27, #6 Valley Center 20. #7 Lincoln 48, #10 Otay Ranch 25. #1 El Capitan 48, #8 Mt. Carmel 6. #4 Brawley 29, #5 West Hills 13. #3 Rancho Bernardo 42, #11 Scripps Ranch 23. #2 San Marcos 28, #7 Lincoln 12. The East County will receive a visit from the far East County when the city of Lakeside plays host to this week's only matchup between teams with double-digit wins. Brawley has won 10 straight games since their 7-0 loss to Hoover in the season opener. El Capitan is making their first semifinal appearance since 1991. They're tied with Bishop's, Christian, and Oceanside for the longest active winning streak in the county. The Broncos will make their first appearance in the semifinals since 2004 when they visit San Marcos with hopes of extending their winning streak to seven games. 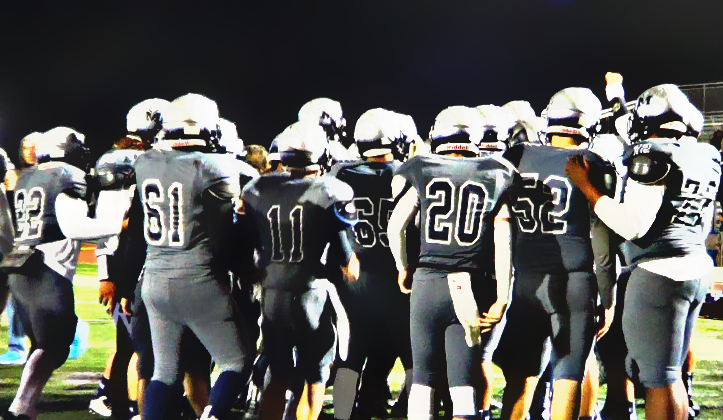 The Knights look to continue their stellar season with a second straight championship berth. #9 Francis Parker 41, #8 Monte Vista 21. #5 Granite Hills 55, #12 Patrick Henry 28. #11 Morse 14, #6 Bonita Vista 7. #10 La Jolla 54, #7 Santa Fe Christian 17. #1 Hoover 69, #9 Francis Parker 28. #5 Granite Hills 42, 38, #4 Fallbrook 7. #11 Morse 12, #3 Sweetwater 0. #2 Christian 42, #10 La Jolla 38. After last week's successful trip to the North County, Granite Hills will travel to the city looking for similar results. Hoover is a win away from their first championship appearance in school history. This will be their first semifinal matchup since 2000. After ending the county's longest active winning streak at 19 games, Morse heads to El Cajon looking to knock off it's second straight undefeated opponent. First they'll have to find a way to shut down a nearly unstoppable run game led by Christian's Adrian Petty. #8 El Cajon Valley 49, #9 Horizon 34. #5 University City 45, #12 Calexico 13. #11 Coronado 24, #6 Orange Glen 20. #7 Clairemont 28, #10 Southwest 13. #1 Bishop's 62, #8 El Cajon Valley 0. #4 Castle Park 31, #5 University City 14. #3 Central 24, #11 Coronado 21. #2 Mater Dei 35, #7 Clairemont 13. After avenging last season's playoff loss to UC, the Trojans face a tough task of trying knock high scoring Bishop's off the unbeaten ranks. The Knights are looking for their first championship appearance since 2010, the year they won the state title. The last time Mater Dei reached the semifinals, they were known as Marian Catholic and went on to win in the 2003 Division III championship. Central is making their second straight semifinal appearance. #1 Holtville 34, #8 Calvary Christian Academy 26. #5 La Jolla Country Day 61, #4 Maranatha Christian 21. #3 Classical Academy 13, #6 Tri-City Christian 10. #2 Vincent Memorial 24, #7 Crawford 15. #5 La Jolla Country Day 53, #1 Holtville 20. #2 Vincent Memorial 30, #3 Classical Academy 0. The Torreys entered the playoffs on a four-game losing streak, but that didn't stop them from earning a section title berth by knocking off last season's Division V champions. Vincent Memorial has won four straight since facing their only loss to that same Holtville squad.